Our first recommendation for expecting families, an Our Neighborhood favorite. “Baby Knows Best” clearly explains the principles of RIE, Resources for Infant Educarers, through the eyes of the modern world. Deborah Carlisle Solomon outlines the tenets of RIE with specific details and stories to help parents begin to reflect on the parent they want to be. 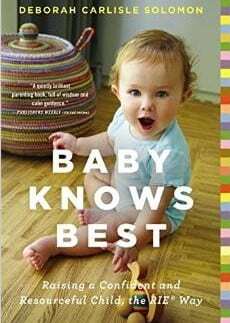 For families who embrace the RIE principles, “Baby Knows Best” includes guidance on care, sleep, play, growth, learning limits, and child care. Our Neighborhood draws on RIE for inspiration and this is a must read for infant teachers and new parents. It’s not the RIE founder’s voice, I’d recommend Magda Gerber’s books but this is a great option for a modern updated view of RIE.